Toyota is to return as lead sponsor of the 2011 Toyota Sprint Series, confirming its commitment to grassroots motorsport. Running since 2008, the Sprint Series brings together current and classic Toyota models to compete against the clock at venues across the country. The 2011 season is expected to attract up to 50 registered participants, driving a wide range of cars from sporting classics such as Celica, MR2 and Supra up to modern day models including Aygo and Yaris. The basic principle of the sprint is to complete a timed run rather than qualify and race side by side. With 16 classes and a newly introduced street category, which allows drivers with more standard cars to be more competitive, points are now awarded to find two overall champions (Street and Pro classes). This in addition to all the class winners, provides everyone with a chance to take home a trophy. Entrants can choose to modify their vehicle as much, or as little as they please, ensuring this is a motorsport event open to all, regardless of budget. 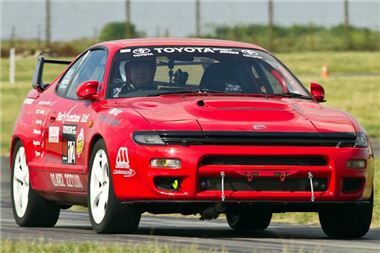 The series was the inspiration of Toyota enthusiasts Barry Cross and Adrian Smith, who came up with the idea in 2007. After a trial series, it was launched officially in 2008 in conjunction with Javelin Trackdays. Toyota was the original lead sponsor for 2008 to help promote the opening season of the series.